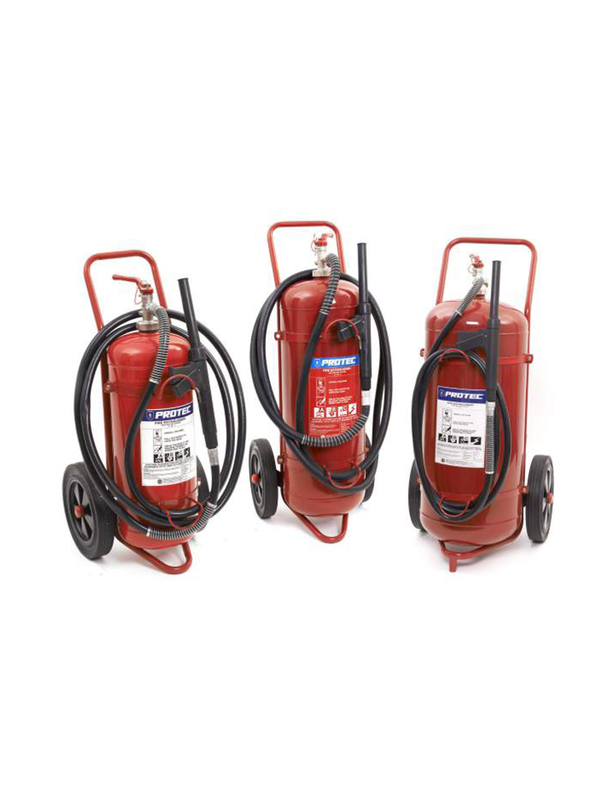 “Protec” ABC Dry Chemical stored pressure wheel trolley fire extinguishers are manufactured and conformed to BS EN 1866 standard under strict ISO 9001:2008 Quality Management System. ABC dry chemical powder is a combination of Mono Ammonium Phosphate and Ammonium Sulphate. The powder is non-conductive and may be used in the presence of an electric current. The powder also has a low melting point and on Class A fires the dry chemical powder fuse and swell to form a barrier which excludes oxygen and completes the extinguishing process and prevents re-ignition. On Class B fires the extinguishing powder interferes with the chemical reactions that take place in the combustion zone, thus the flame ceases to exist. ABC powder will extinguish class A (carbonaceous) fires, class B (flammable liquid) fires and class C (flammable gas) and electrical energised fires.